The Labrador is a decendant of the St. Johns Water Dog and were first bred in the islands of Newfoundland. They are said to have setters and mastiff ancestors which account for their strong hunter and water drives. Labradors are always registered in one of three colors: black, yellow or chocolate. 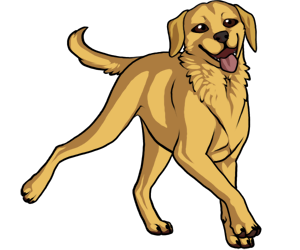 There are two variations of the Labrador breed -- English and American. English Labradors are known as show quality and are tested in conformation competitions. American Labradors are known for feild trials and are tested in agility, hunting, obedience, frisbee, flyball and dock jumping.